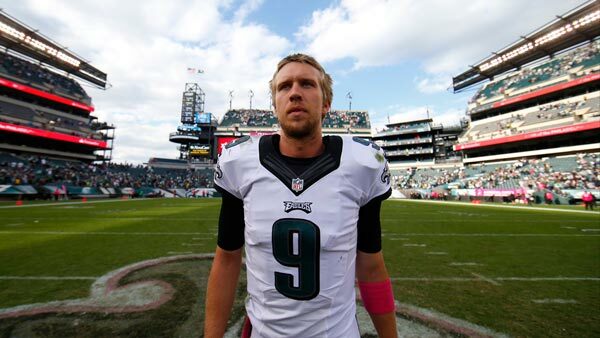 PHILADELPHIA (WPVI) -- Nick Foles is returning to the city where he had his most success. The Philadelphia Eagles agreed to terms on a two-year contract with Foles on Monday, bringing him back to serve as the backup quarterback for Carson Wentz two years after former coach Chip Kelly traded him to St. Louis. The 28-year-old Foles was drafted in the third round in 2012 by Philadelphia under Andy Reid. He thrived under Kelly a year later, going to the Pro Bowl after having one of the best statistical seasons in NFL history. Foles threw 27 touchdown passes and only two interceptions in 10 starts while leading the Eagles to an NFC East title that season. On Monday afternoon, the Eagles released Chase Daniel, who signed a $21 million, three-year contract last year. Foles was 14-4 as a starter for the Eagles in 2013-14. He was 4-7 in 11 starts for the Rams in 2015 and won his only start for Kansas City while serving as a backup to Alex Smith last year. Eagles coach Doug Pederson was Philadelphia's quarterbacks coach during Foles' rookie season. In five seasons, Foles has completed 60.4 percent of his pass attempts for 9,215 yards with 56 TDs and 27 interceptions for an 88.1 passer rating. After going 7-9 in 2016, the Eagles have made a splash in free agency. They've added wide receivers Alshon Jeffery and Torrey Smith and offensive lineman Chance Warmack.